Welcome to the HeartMob Resource page! Being harassed online is never ok, and HeartMob is here to support you in anyway we can. On this page you'll find links to our guides, information on supportive organizations, and other helpful resources. 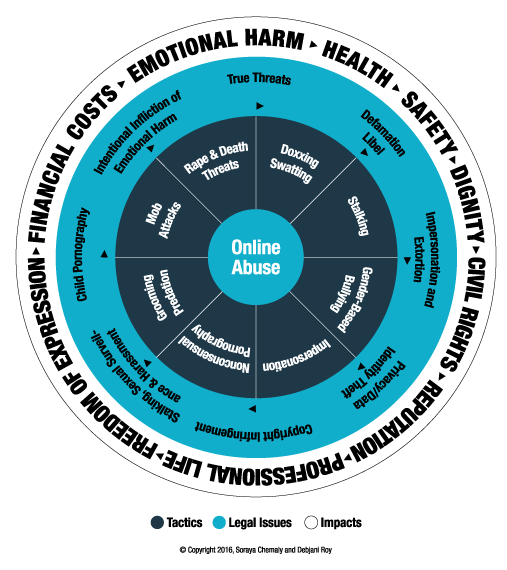 The Online Abuse Wheel, created by Soraya Chemaly and Debjani Roy, is based on the Domestic Abuse Intervention Program’s Power and Control Wheel which was created in 1984, to better understand the experiences of survivors of domestic violence. The wheel was created with the understanding that online harassment and abuse sits on a continuum of gender based violence which includes sexual violence, trafficking, harmful practices such as forced marriage, and many more. This framework of the wheel is used to illustrate and help us think about the key connections between the tactics used to harass, the overlaps with what is considered illegal depending on various contexts, and ultimately the impacts, both short-term and long-term, that online harassment and abuse has on those who are targeted. To better understand the wheel and for specific definitions for the terms used, check out Women’s Media Center Free Speech Project.